SaugusSpeedway.net LW3411 | Saugus | Annual Saugus Rodeo: End of Show, n.d. (1920s-1930s). Saugus Rodeo: End of show. Photograph by Charles Miller, 9126 Sunset Blvd., Hollywood, California. Original print, 6½x9½ inches, on heavy art stock. The photograph is undated; probably late 1920s or early 1930s. It comes from a grouping of approximately three dozen photos by Miller, some showing the San Fernando Mission and other California missions, others from out of town and out of state, esp. the Dallas area. Here is another Charles Miller photo of the Saugus Rodeo. 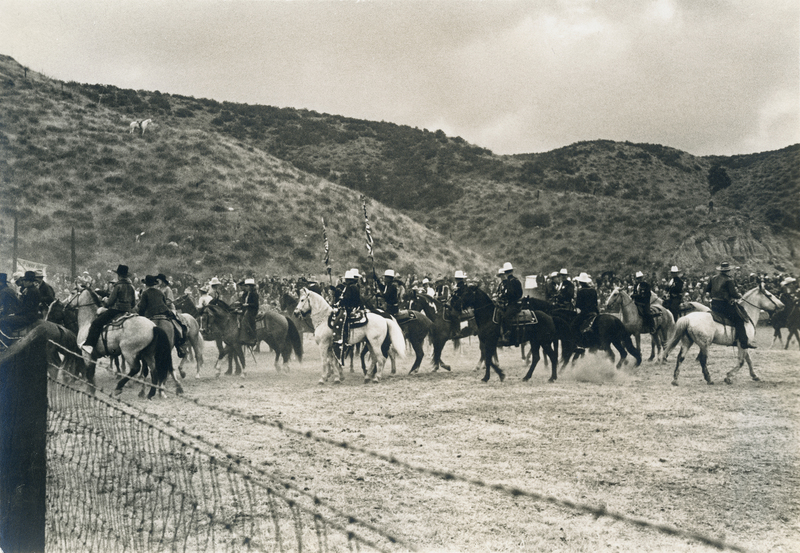 Thirty-three thousand spectators observed the 1930 Saugus Rodeo — and an estimated 25,000 were turned away for lack of capacity — in a valley that sported an entire population of maybe 3,000. Despite its success, the 1930 rodeo (held April 27) would be the last under Roy Baker's ownership. The Great Depression was on, and Baker, who started the rodeo in 1926 with Bob Anderson, was forced to call it quits. He sold out to Hoot Gibson, star of both the rodeo circuit and the box office. "In the immediate future, I will assume complete charge of the Baker Ranch Rodeo. Messrs. Roy Baker and Bob Anderson have together brought this annual event from its inception to its present success and deserve to be congratulated. It is my earnest aim and ambition to take up their reins and make of it the biggest and most spectacular thing of its sort in the entire world. "Next year I plan to improve the Baker Ranch Rodeo in every possible way. There will be bigger money prizes. The best riders in the world will be on hand to compete for world's titles. There will be more spectacular races, more hazardous stunts and a show that will be faster and more exciting than any ever attempted heretofore. "This ranch will co-operate with the Pendleton Round-Up, Calgary Stampede, Cheyenne Frontier Days, Chicago Rodeo, Madison Square Garden, Salinas and other great rodeos, to bring California and the West Coast the very finest riders and horses in the world. Winners of events at these shows will be particularly invited to Baker Ranch to participate for greater cash prizes than ever offered here previously. "Not only do I promise greater spectacles and more thrills but every effort will be bent to provide for the greater comfort of spectators. There will be three new paved roads leading to this ranch next year. The stadium will be enlarged, covered and made more comfortable. Every convenience and aid to the pleasure of the man in the audience will be anticipated and coped with. "An airport adjoining the stadium will provide a landing field for private and commercial planes, placing the Baker Ranch Rodeo within five minutes of Los Angeles and within easy flying distance of cities throughout the West and Middle West. "Suggestions for the betterment of this annual event will be appreciated. Particularly do I invite ideas for a name that may become as world familiar as are such titles are "The Pendleton Round-Up" and "Calgary Stampede." Such suggestions, mailed to me in care of Baker Ranch, Saugus, California, will be treated with every courtesy. "Here is to a bigger and better rodeo in 1931. I trust today's offerings pleased you and promise that next year there will be much more in the way of thrills and excitement." Big promises. Gibson made good on some of them. Others, not so much. But he gave it a good run for a few years and brought out his Western film buddies including William S. Hart, Harry Carey, Tom Mix and John Wayne. Gibson continued to produce the rodeo even after he sold it in 1934, but the Great Flood of March 2, 1938, wiped it out. Bill Bonelli bought the grounds out of foreclosure later that year and introduced auto racing in 1939. He continued to hold rodeos into the 1940s and 1950s, but the dream of turning Saugus into another Pendleton Round-Up or Calgary Stampede was gone. LW3411: 9600 dpi jpeg from original photograph purchased 2018 by Leon Worden.